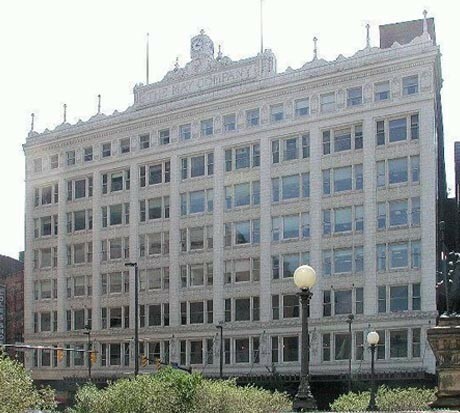 Precision Environmental was selected by Agent Services of New York and their construction manager Nova Corp. of New Jersey to provide asbestos abatement and selective demolition service of the historic May Company department store to convert it to Telecommunications Square. The work took place from the basement through the third floor and again on the ninth floor mobilizing 720,000 square feet of the massive landmark. Asbestos plaster ceilings, thermal system insulation, floor tile and mastic were removed prior to the selective demolition. Four thousand cubic yards of asbestos materials were removed to faciliatate the renovation. Asbestos debris was handled internal to the building and packaged for disposal within the structure to eliminate any potential exposure to the public or building occupants. Following the abatement was the selective demolition to provide a “white box" space. Walls, partitions, casework, M.E.P. system, terrazzo as well as hand wood floors systems were removed. Perimeter walls were stripped to expose the bare masonry. Unique systems of the former department also required demolition. This included escalators from the basement to the fourth floor, abandoned elevators, package conveyors, merchandise racks, and a chute used to move merchandise from the warehouse upper floors to the sales floors below all required removal. Precision utilized a 2 trash chute system as well as an 80 foot long ramp that had to be built to move the waste generated by the demolition in the basement to street level. The year long project was completed without injury or incident. This project also utilized every service offered by Precision Environmental including temporary electric, heat, water supply, concrete placement, floor preparation and carpentry. Mass selective interior demolition along with asbestos abatement of various materials including fireproofing and thermal insulation.